Shannon, thank you so much. You've perfectly captured Flannery here. It means a lot to me that you painted her - portrait of a beloved pet by a beloved friend. Best birthday gift ever! You are most welcome! I loved painting Flannery for you and will be happy to visit the painting wherever you choose to hang it. 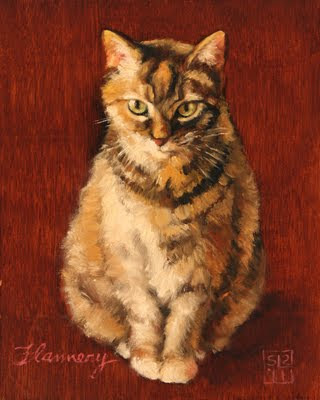 Shannon, i absolutely love this painting of Flannery! I also adore cats, and I bet this was a great gift as well. I would be glad to have it too. Keep up the good work, and I can't wait to see more of your work! A lovely cat portrait. Your doggies are wonderful, too! Hi Shannon. I stumbled on your blog- a happy accident!! Lovely paintings, thanks for sharing! Thank you very much, Lina-Paola! I love that picture of Flannery. I love cats too!